Kirby is popularly acknowledged by comics creators and fans as one of the greatest and most influential artists in the history of comics. His output was legendary, with one count estimating that he produced over 25,000 pages during his lifetime, as well as hundreds of comic strips and sketches. He also produced paintings, and worked on concept illustrations for a number of Hollywood films. 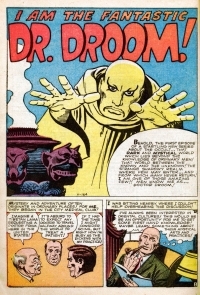 In 1985, Mark Evanier revealed that thousands of pages of Kirby's artwork had been lost by Marvel Comics. 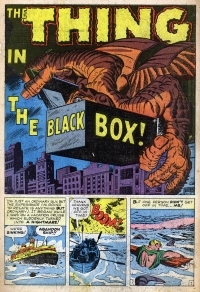 These pages became the subject of a dispute between Kirby and that company. 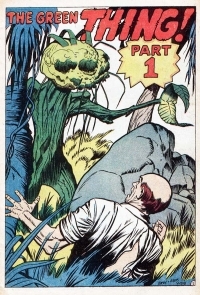 In 1987, in exchange for his giving up any claim to copyright, Kirby received from Marvel the 2,100 pages of his original art that remained in its possession. 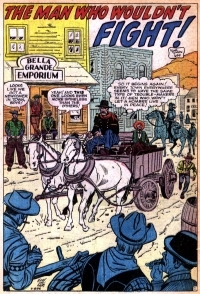 The disposition of Kirby's art for DC, Fawcett, and numerous other companies has remained uncertain. 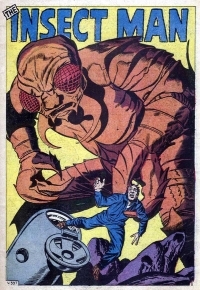 Jacob Kirgstein, a character in The Authority comic books, is inspired by Jack Kirby. 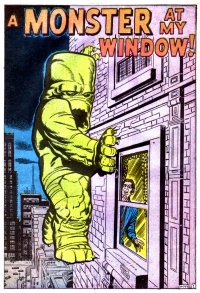 The Kirby Awards were named in honor of Jack Kirby. 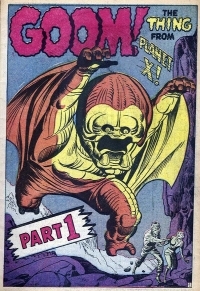 Rock music group Monster Magnet referenced Kirby's cultural impact in their song, "Melt", which includes the lyrics, "I was thinking how the world should have cried/On the day Jack Kirby died." Jazz percussionist Gregg Bendian's group Interzone recorded a tribute album, Requiem for Jack Kirby, in 2001. 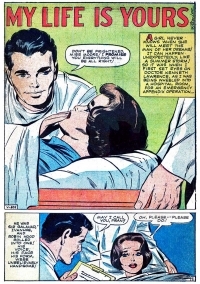 In an issue of the Fantastic Four, when the team went to Heaven, God closely resembled Jack Kirby (their co-creator). In the animated television series, Superman: The Animated Series, the supporting character Dan Turpin is modeled visually after Jack Kirby. 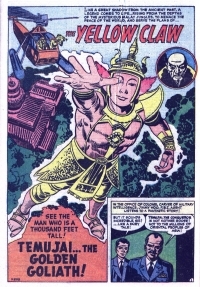 It should be noted that this character was created by Mr. Kirby himself for the New Gods title. 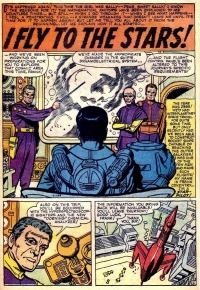 The 38-39 episodes titled "Apokolips Now" were also dedicated to the memory of Jack Kirby. 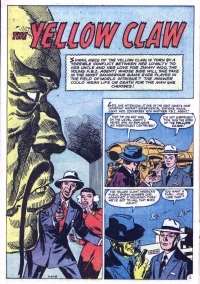 In Kurt Busiek's comic book Astro City, many Kirby references and tributes appear, such as a mountain called Mount Kirby, and a character called the Silver Agent, who seems to be a pastiche of Captain America, the Guardian, and Silver Star. An episode of the animated series Teenage Mutant Ninja Turtles (2003) entitled "King" (and comic Donatello #1, "Kirby and the Warp Crystal" (1986)) featured a character based on Jack Kirby whose drawings came to life. 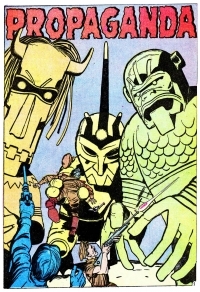 When the Turtles go into Kirby's fantasy world, they find characters based on The New Gods. 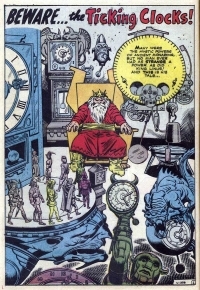 Alan Moore's final storyline in Supreme: The Return features a character known as King, an inhabitant of Idea Space, who is clearly modeled after Kirby and is heralded by Kirby dots. 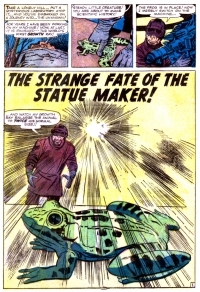 The storyline features tributes to characters Kirby created or had a hand in defining, such as the Newsboy Legion, Guardian, the New Gods, and Doctor Doom. 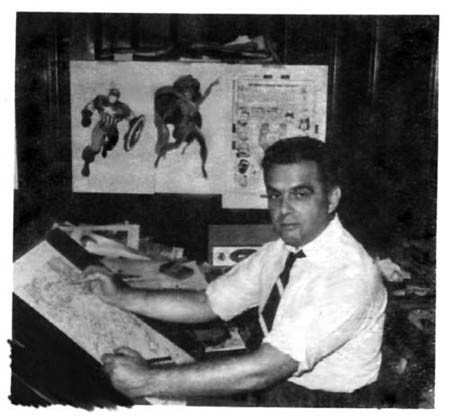 The videogame Marvel Super Heroes is made in memory of Jack Kirby, as it was finished a year after his death. In 'Happy Birthday, Martha Washington' (by Frank Miller), Martha Washington is sent by the US government to collect a blood sample from the world's only super-hero, the self-created patriot Captain Kurtz. Martha eventually refuses to see his heroic legacy abused. 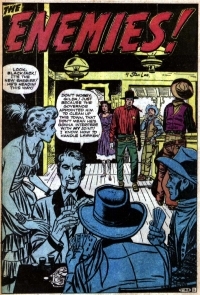 Lisa Kirby, Jack Kirby's daughter, announced in early 2006 that she and co-writer Steve Robertson, with artist Mike Thibodeaux, plan to published a six-issue miniseries, Jack Kirby's Galactic Bounty Hunters, featuring characters and concepts created by her father. Jacob Kurtzberg grew up on Suffolk Street in New York's Lower East Side, attending elementary school at P.S. 20. His father, a garment-factory worker, was a Conservative Jew, and Jacob attended Hebrew school. Jacob's one sibling, a brother five years younger, predeceased him. 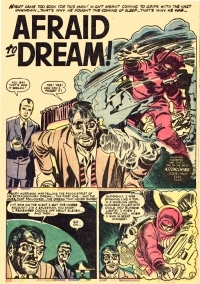 After a rough-and-tumble childhood with much fighting among the kind of kid gangs he would render more heroically in his future comics, Kirby enrolled at the Pratt Institute in Brooklyn, at what he said was age 14, leaving after a week. "I wasn't the kind of student that Pratt was looking for. They wanted people who would work on something forever. I didn't want to work on any project forever. I intended to get things done." 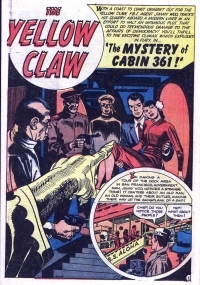 Essentially self-taught, Kirby cited among his influences the comic strip artists Alex Raymond and Milton Caniff. 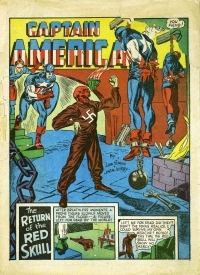 The Golden Age of Comics Captain America Comics #1 (March 1941), art by Jack Kirby (penciler) and Joe Simon (inker). 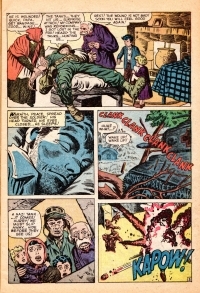 Enlarge Captain America Comics #1 (March 1941), art by Jack Kirby (penciler) and Joe Simon (inker). 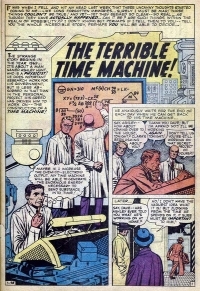 Per his own sometimes-unreliable memory, Kirby joined the Lincoln Newspaper Syndicate in 1936, working there on newspaper comic strips and on single-panel advice cartoons such as Your Health Comes First (under the pseudonym "Jack Curtiss"). He remained until the firm went out of business in 1938, then worked for the movie animation company Fleischer Studios as an "in-betweener" (an artist who fills in the action between major-movement frames,) on Popeye cartoons. "I went from Lincoln to Fleischer," he recalled. "From Fleischer I had to get out in a hurry because I couldn't take that kind of thing," describing it as "a factory in a sense, like my father's factory. They were manufacturing pictures." Around this time, "I began to see the first comic books appear." 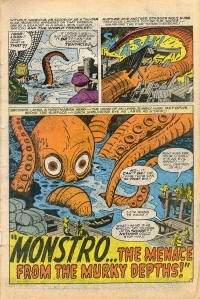 The first American comic books were reprints of newspaper comic strips; soon, these tabloid-size, 10-inch by 15-inch "comic books" began to include original material in comic-strip form. 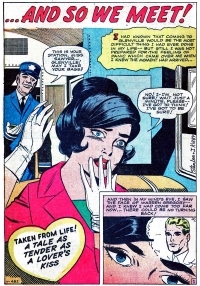 Kirby began writing and drawing such material for the comic book packager Eisner & Iger, one of a handful of firms creating comics on demand for publishers. 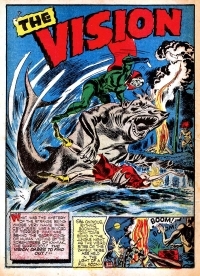 Through that company, Kirby did what he remembers as his first comic book work, for Wild Boy Magazine. 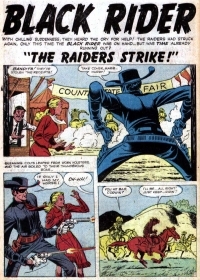 This was followed by such strips as the science fiction adventure The Diary of Dr. Hayward (under the pseudonym "Curt Davis"), the modern-West crimefighter strip Wilton of the West (as "Fred Sande"), the swashbuckler strip "The Count of Monte Cristo" (again as "Jack Curtiss"), and the humor strips Abdul Jones (as "Ted Grey)" and Socko the Seadog (as "Teddy"), all variously for Jumbo Comics and other Eisner-Iger clients. Kirby moved on to comic book publisher and newspaper syndicator Fox Feature Syndicate, earning a then quite-reasonable $15 a week salary. He began exploring superhero narrative with the comic strip The Blue Beetle (January�March 1940), starring a character created by Chuck Cuidera4 in Mystery Men Comics #1 under the pseudonym "Charles Nicholas", which Kirby retained. Simon & Kirby During this time, Kirby met and began collaborating with cartoonist and Fox editor Joe Simon, who in addition to his staff work continued to freelance. Speaking at a 1998 Comic-Con International panel in San Diego, Simon recounted the fateful meeting: I had a suit and Jack thought that was really nice. He'd never seen a comic book artist with a suit before. The reason I had a suit was that my father was a tailor. Jack's father was a tailor too, but he made pants! Anyway, I was doing freelance work and I had a little office in New York about ten blocks from DC's and Fox [Feature Syndicate]'s offices, and I was working on Blue Bolt for Funnies, Inc. So, of course, I loved Jack's work and the first time I saw it I couldn't believe what I was seeing. He asked if we could do some freelance work together. I was delighted and I took him over to my little office. We worked from the second issue of Blue Bolt...  and remained a team across the next two decades. 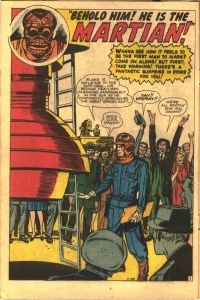 Collectors have shown what is purported to be original art for an unpublished, five-page Simon & Kirby collaboration titled "Daring Disc", which may predate the duo's Blue Bolt . Autobiographical material by and interviews with Simon and Kirby do not appear to mention this story. 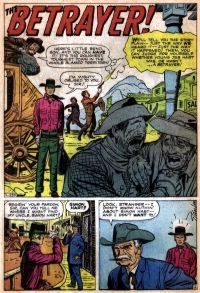 Page two of "Daring Disc". 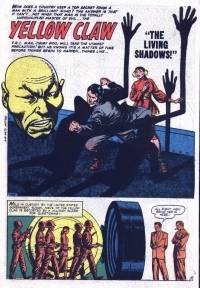 Note the kinetic similarities to Captain America's shield Enlarge Page two of "Daring Disc". Note the kinetic similarities to Captain America's shield After leaving Fox and landing at pulp magazine publisher Martin Goodman's Timely Comics (the future Marvel), the new Simon & Kirby team created the seminal patriotic hero Captain America in late 1940. 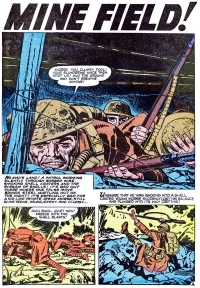 Kirby's dynamic perspectives, groundbreaking use of centerspreads, cinematic techniques and exaggerated sense of action made the title an immediate hit and rewrote the rules for comic book art. 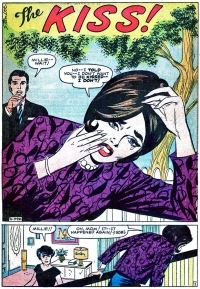 Captain America Comics is credited with comics' first full-page panel. Captain America became the first and largest of many hit characters the duo would produce. 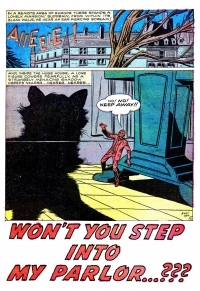 The Simon & Kirby name soon became synonymous with exciting superhero comics, and the two became industry stars whose readers followed them from title to title. 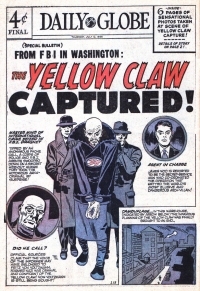 A financial dispute with Goodman led to their decamping to National Publications, the primary precursor of DC Comics, after ten issues of Captain America. 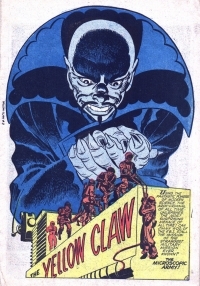 Given a lucrative contract at their new home, Simon & Kirby revamped The Sandman in Adventure Comics, and scored their next hits with the "kid gang" teams the Boy Commandos and the Newsboy Legion, and the superhero Manhunter. Kirby married Rosalind "Roz" Goldstein (September 25, 1922�December 22, 1998) on May 23, 1942. That same year he changed his name legally from Jacob Kurtzberg to Jack Kirby. The couple was living in Brighton Beach, Brooklyn, when Kirby was drafted into the U.S. Army in the late autumn of 1943. Serving with the Third Army combat infantry, he landed in Normandy, on Omaha Beach, 10 days after D-Day. 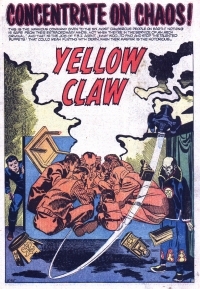 As superhero comics waned in popularity after the end of World War II, Kirby and his partner began producing a variety of other genre stories. They are credited with the creation of the first romance title, Young Romance Comics at Crestwood Publications, now renamed Prize Comics. 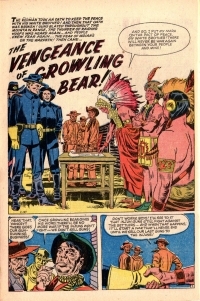 In addition, Kirby and Simon produced crime, horror, western and humor comics. The Kirby & Simon partnership ended amicably in 1954 with the comic-book industry beset by self-imposed censorship and negative publicity and the failure of their own Mainline Publications. 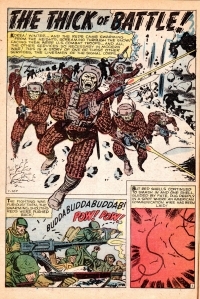 Kirby continued to create comics, reinventing Green Arrow in DC's Adventure Comics and creating the well-received feature about a group of death-defying adventurers, the Challengers of the Unknown. 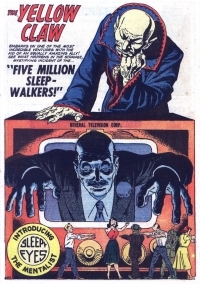 Stan Lee and Marvel Comics One of comics' most famous covers: The Avengers #4, art by Jack Kirby and George Roussos. 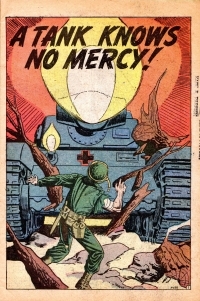 Enlarge One of comics' most famous covers: The Avengers #4, art by Jack Kirby and George Roussos. 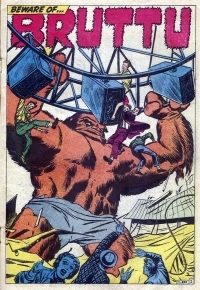 Kirby returned to Marvel during its 1950s iteration as Atlas Comics. 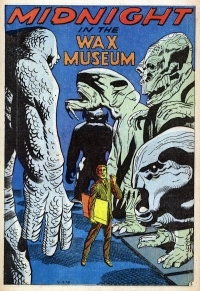 There he drew a series of imaginative monster, horror and science fiction stories for its many anthology series, such as Strange Tales, Tales to Astonish and Tales of Suspense. 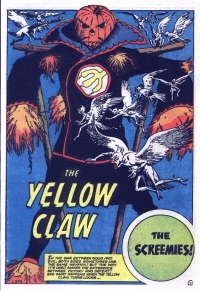 His bizarre designs of powerful, unearthly creatures proved a hit with readers. Then, with Marvel editor Stan Lee, Kirby began working on superhero comics again, beginning with The Fantastic Four #1 (Nov. 1961). The landmark series became a hit that revolutionized the industry with its true-to-life naturalism and, eventually, a cosmic purview informed by Kirby's seemingly boundless imagination � one coincidentally well-matched with the consciousness-expanding youth culture of the 1960s. 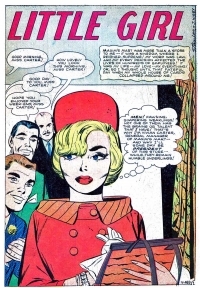 Over the next several years, Kirby served Marvel as de facto art director, co-creating/designing many of the Marvel characters and teaching new artists how to draw in the "Marvel style". 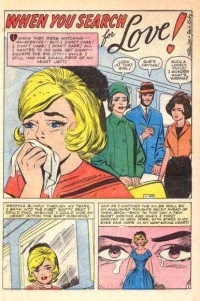 (When, in the early seventies, he left Marvel to work for Carmine Infantino at Marvel rival DC Comics, Kirby quipped he was "basically competing against myself".) Highlights besides the Fantastic Four include Thor, the Incredible Hulk, Iron Man, the original X-Men, the Silver Surfer, Doctor Doom, Galactus, The Watcher, Magneto, Ego the Living Planet, the Inhumans and their hidden city of Attilan, and the Black Panther � comics' first major Black superhero � and his African nation of Wakanda. 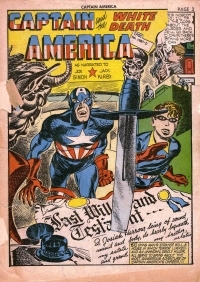 Simon & Kirby's Captain America was reincorporated into Marvel continuity. Kirby continued to expand the medium's boundaries, devising photo-collage covers and interiors, and other experiments. Yet he grew increasingly frustrated by Marvel's refusal to credit him specifically for his story co-plotting and for his character creations and co-creations. 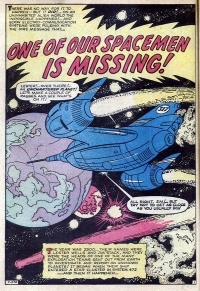 Later career New Gods, flagship title of the Fourth World series, Kirby's most notable later creation. 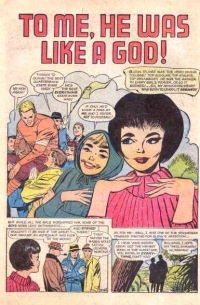 Enlarge New Gods, flagship title of the Fourth World series, Kirby's most notable later creation. 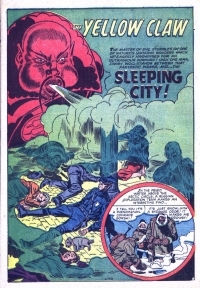 After falling out with Lee, Kirby returned to DC in the early 1970s, where he produced a series of titles under the blanket sobriquet The Fourth World. 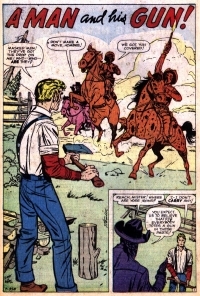 In addition, he also included the minor Superman title, Jimmy Olsen. This choice was because the failing series was between artists and Kirby did not want to cost anyone a job in favor of himself. The interrelated titles he produced for this were New Gods, Mister Miracle, and The Forever People. 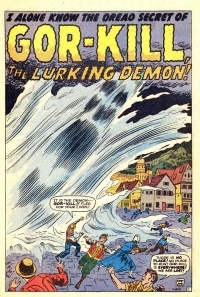 Kirby also produced other DC titles such as OMAC, Kamandi, The Demon, and (together with former partner Joe Simon for one last time) a new incarnation of the Sandman. 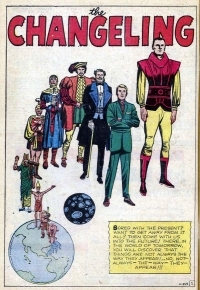 Several characters from this period have since become fixtures in the DC universe, including the demon Etrigan and his human counterpart Jason Blood; Scott Free (Mister Miracle), and the cosmic villain Darkseid. 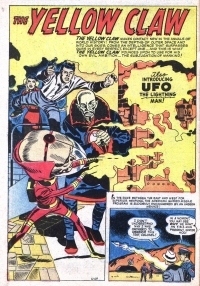 Kirby then returned to Marvel Comics where he both wrote and drew Captain America and created his last major comics concept with the series The Eternals, which featured a race of inscrutable alien giants, the Celestials, whose behind-the-scenes intervention evolved life on Earth. 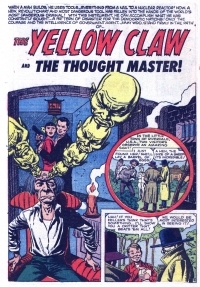 This concept has since become a central tenet of the Marvel universe, and the rationale for the existence of its super-beings. 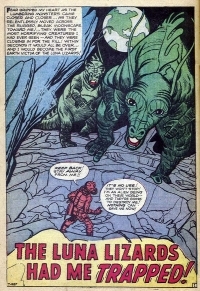 Kirby's other Marvel creations in this period include Devil Dinosaur, Machine Man, and an adaptation and expansion of the movie 2001: A Space Odyssey. 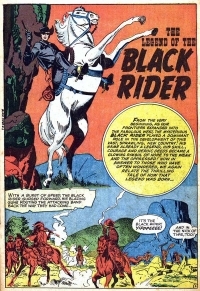 He also wrote and drew The Black Panther and did numerous covers across the line. 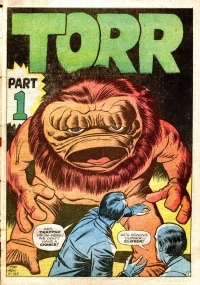 Kirby eventually left Marvel to work in animation, where he did designs for Turbo Teen, Thundarr the Barbarian and other animated television series. 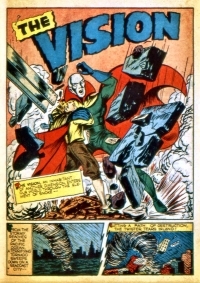 In the early 1980s, Pacific Comics, a new, non-newsstand comic book publisher, made a then-groundbreaking deal with Kirby to publish his series Captain Victory and the Galactic Rangers: Kirby would retain copyright over his creation and receive royalties on it. 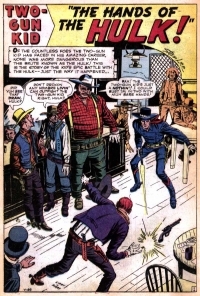 This, following similar action by fellow independent Eclipse Comics and a longtime push by artist Neal Adams for industry reform, helped establish a precedent for other professionals and end the monopoly of the "work for hire" system, wherein comics creators, even freelancers, had owned no rights to characters they created. 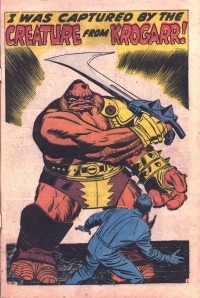 Kirby also retained ownership of characters used by Topps Comics beginning in 1993, for a set of series in what the company dubbed "The Kirbyverse". cover I Was a Stand-In for Love! 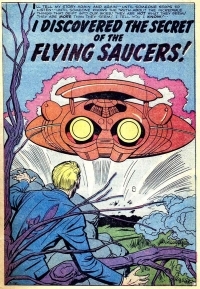 cover I Discovered The Secret Of The Flying Saucers! cover He Stole Fifty Years! cover I Found The Ninth Wonder Of The World! I Was the First Man to Set Foot on the Mystery Planet! cover Trapped in the Haunted Mine! The Man with the Gun! 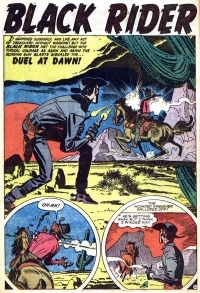 cover The Capture of Kid Colt! cover The Gunmen of Dodge City! cover Guardian of the Stars? 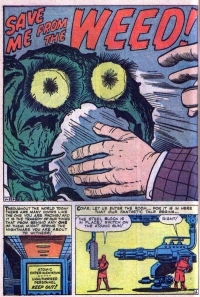 cover The Creature From Planet X! I Was A Human Satellite! My Job: Catch A Robot! 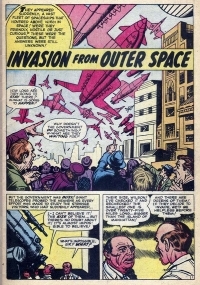 cover Invasion from Outer Space! The Man with the Atomic Brain! cover The Day the Kid Gave Up! 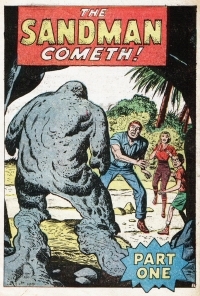 cover The Giant From Outer Space! cover The Day of the Badman! The Start of the Two-Gun Kid! cover The Threat From the 5th Dimension! The Man in the Iron Box! cover Xom! 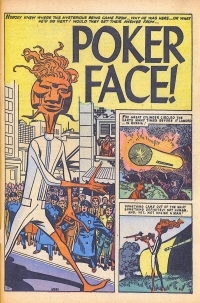 The Menace from Outer Space! The Creatures Who Captured The Earth!! cover One Of Us Is A Martian! cover The Waco Gang Strikes! cover Doc Halliday, the Most Dangerous Man in the West! cover Captured by the Apaches! The Man the Marshal Feared! Find 'Em! Chase 'Em! Blast 'Em! cover The Three Who Vanished! Don't Send Me Out There! cover The Gargoyle from the 5th Galaxy! cover When Wakes the Sphinx! cover The Things On Easter Island! cover I Unleashed Monstro On The World! cover Don't Ask Me To Marry You!! cover Don't Try to Tame Me! I Became A Human Robot! cover I Found the Giant in the Sky! cover We Both Loved Tony! cover Give Up Your Guns! The Mark of the Outlaw! cover I Hear It Howl in the Swamp! cover I Saw The Invasion Of The Stone Men! cover I Flew In The Berlin Airlift! The Mission That Had To Fail! I Was A Recruit Under Fire! 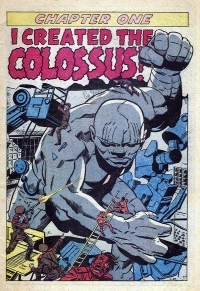 cover I Fought The Colossus! cover The Durfees Take Over Dodge City! cover I Brought Zog the Unbelievable, Back to Life! cover I Learned About Love from Larry! 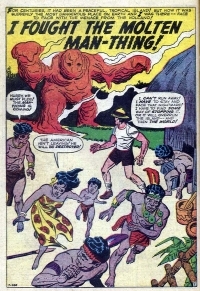 cover I Fought the Molten Man-Thing! cover The Outlaw and the Lady! cover I Found My Heart's Desire! cover Grottu! King of the Insects! cover We Attack the Commies! cover Orogo! The Thing from Beyond! cover Gorgolla The Living Gargoyle! Beware The Hands of Hundu! cover A Thing of Beauty! cover A Bullet for a Badman! cover Wanted!! Dead or Alive! cover Droom! The Living Lizard! cover Be Outta Town by Noon, Kid!! cover Face-To-Face With The Enemy! cover When Wyatt Went to Jail! cover The Guns of Don Drago! When the Kid Crawled Away! cover The Death of Kid Colt! The Fury of Ox Miller! cover I Am Dragoom! The Flaming Intruder! cover I Found Monstrom, The Dweller in the Black Swamp! cover I Created Spoor, The Thing That Could Not Die! cover The Ghost of Midnight Mountain! cover Here Comes Gomdulla the Living Pharaoh! 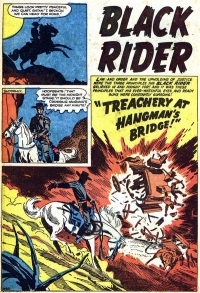 cover The Legend of the Rawhide Kid, Outlaw! 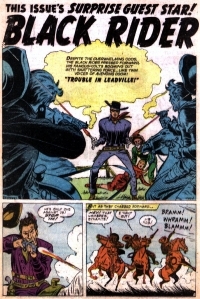 cover The Terrible Revenge of the Two-Gun Kid! cover Gunfight in Gila Pass! cover Trapped by the Bounty Hunter! cover A Martian Prowls Among Us! cover Gun-Duel in Trigger Gap! cover Shootout With Sundance Slade! cover Kid Colt Goes on the Rampage! cover Beware of Montana Joe! cover I Battled Rorgg, King of the Spider Monsters! cover Shoot-Out with Blackjack Bordon! cover The Guns of Drago Dalton! cover A Trap for the Kid! cover The Return of the Hulk! cover Prisoner of Wolf Waco! cover The Thing Called Metallo! cover The Gunmen of Sundown City! cover The Day the Kid Was Captured! cover Beware the Terrible Totem! cover The Return of Gargantus! cover I Was Captured by Korilla! cover Guns Roar in Gila Pass! cover Guns Talk in Tombstone! cover I Who Created Mechano! 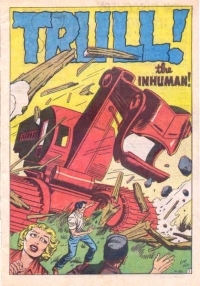 cover It's Trull ... the Inhuman!! cover No Place to Hide! cover We Were Trapped In The Twilight World! cover The Return of Grogg! cover The Man with the Blazing Guns! cover The Thing in the Black Box!! Midnight in the Wax Museum! 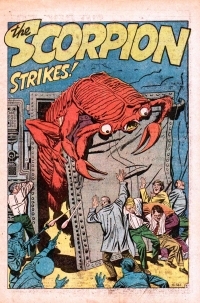 cover Sserpo, The Creature Who Crushed The World! cover The Creature from Krogarr! cover Lo-Karr Bringer of Doom! Mister Gregory and the Ghost! cover The Four Armed Things! cover The Thing Waits for Me! cover Anatomy of a Gun-Fight! 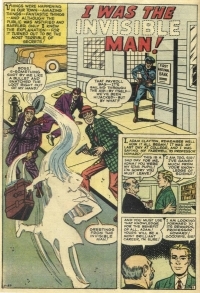 cover Kid Colt Faces the Ghost of Silver City! cover The Man In The Ant Hill! cover I Don't Believe in Ghosts! cover I Am the Gorilla Man! 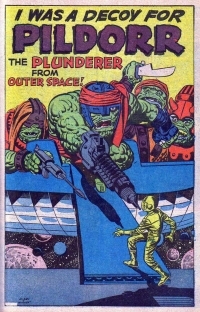 cover Pildorr, The Plunderer from Outer Space! 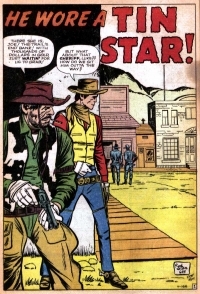 cover I'm Callin' You Yellow, Kid Colt!! cover I'm Lost Without You! cover When The Space Beasts Attack! cover When Oog Lives Again! cover A Teen-ager Can Also Hate! cover Won't You Step into My Parlor? cover When an Outlaw Escapes!! cover I Dream of Doom! cover The Ruler of Earth! cover The Haunted Roller Coaster! The Girl In The Black Hood! cover The Rage of Billy the Kid! cover The Monster In The Iron Mask! cover The Man In The Bee-Hive! cover I Was A Prisioner Of The...Chamber Of Fear!! 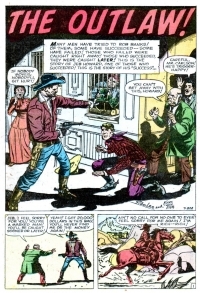 cover How Kid Colt Became an Outlaw! cover I Can Outdraw Kid Colt!! cover The Other Kid Colt! cover Hagg, Hunter Of Helpless Humans! cover The Teen-Ager Who Ruled The World! cover To Me, He Was Like a God! cover I Dare Not Tell Him! cover He Can't Out-Draw Drago!